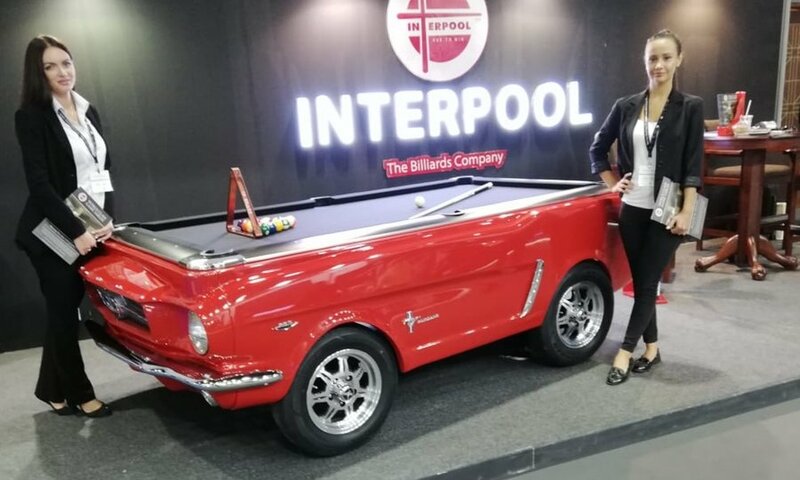 A Very proud moment this, as Interpool Billiards Company, rolls out The 1965 FORD Mustang Car Pool table, at the Hotel & Leisure Show 2018, World Trade Centre Dubai. Truly a Crowning Glory moment, as it hogs all the limelight and attention, from Industry Captains at the Region’s Calendared event. This beauty of a Pool table, is a certain head turner that will take centre stage, and bask in the glory for three days. Draped in Red & Black, this stunning model will pose for all the shutter bugs, media and trade visitors, who would be vying for an audience with her. We are told that This Vintage Classic, was the ORIGINAL American Muscle Car – just ask 007. The Ford Mustang Pool Table, is the ONLY Officially Licensed, Collector’s Edition pool table, for Ford Motor Company, USA. You will be surprised, that it comes with its own VIN Serial number and Title, that is Certificate of Authenticity. Besides the Original working lights, there are real chrome car parts, original car rims & tires, making it A Collectors Pride. No wonder, these sleekly designed pool tables, adorned Royal Palaces, Prime Ministers Private Office, Museums, Luxury Hotels and affluent homes in 29 countries. In the US, there is an idiom, that One Persons trash is Another’s Treasure, And that is never truer with this 1965 Model Car Pool table. At times, it is seen that customers jokingly consider ripping the Car Pool table, in exchange for the original parts. Interestingly, whilst producing the Car pool table, one has to actually scout and look for that particular model of the car. Once the beauty is spotted, it gets to the body shop, it is tailored up, welded together, molded from actual car parts. These molds are processed through Fiber glass, and then send to the paint shop, thereafter led to a bit of groom up on the chromes, bumpers, grills etc. Once that is in place, the wires are tweaked up, all electrical are put in place, including Original lights & Originals tires. The next challenge is to add life to it, and marry all real car parts, to that of a professional pool table. One needs to build a precise and accurate wooden frame, that will shoulder three heavy Brazilian slates, and the customized cushion from solid wood. Now for the icing on the cake, choose the colour of the felt that you fancy, mix and match the wraparound on the gorgeous table, and what you see, is An Absolute head turner! Conceived, Created & Crafted 100% in the USA. It’s Time to Bring the Party Home!